When the power goes out or a surge shuts everything down, you are left sitting in the dark. All of your electronic items are now about as useful as paperweights, and your major appliances are down for the count. More so, the food in your fridge could be lost if the power outage persists. If this has ever happened to you before, then you know just how irritating and inconvenient a power outage can be. You could stock up on candles, flashlight batteries, and board games to while away the hours before the power is restored, or you could avoid the entire mess by investing in a generator. At Chesapeake Electric, we take a great deal of pride in the quality of our products and the skill of our licensed technicians. With over 10 years of experience and emergency services available 24 hours a day, you can count on our team to help you keep the lights on. While portable generators are nice to take with you wherever you go, standby generators are a permanent solution to extended outages on your property. Installed in a concrete pad in your yard, standby generators will provide uninterrupted backup power for days. They are directly connected to your home’s electrical panel and powered by an external fuel supply, typically natural gas, liquid propane, or diesel. At Chesapeake Electric, our generators come in a variety of sizes and capacities. From small enough to energize just a few circuits at a time to large enough to sustain your entire property, you’re sure to find a generator that exactly fits your needs when you work with our outstanding team. Now that you have decided purchasing a generator is a smart way to protect your family from power outages, the knowledgeable team at Chesapeake Electric can help you sort out the details. The type of generator you can have will sometimes depend on your local ordinances. City ordinances are often more restrictive than in rural areas, so our technicians will assess your property and provide sound advice as to which generators would work for your situation. 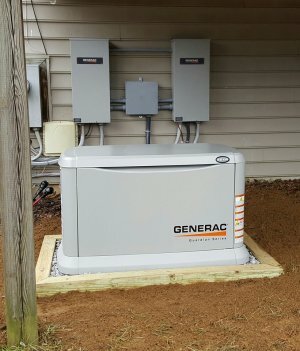 Installing a standby generator is no DIY project, that’s for sure. You need advanced electrical and plumbing skills and a thorough knowledge of local building codes, all of which can be found in the experienced technicians at Chesapeake Electric. Our dedicated team can ensure that you and your family’s lives will continue on as usual, even in the midst of power outages and power surges. Your safety is our number one priority, which is why we offer 24-hour emergency services and fast turnaround times. If you would like to install a generator on your property, give us a call at (410)280-3388 today!